We were absolutely thrilled to have ITN reporter and presenter Warren Nettleford join us for our annual trends forecasting event last month, talking us through his views on the year ahead and what we can expect as fellow media folk. We sat down with him to find out more about his background, how he copes with the stresses of the industry, advice for young journalists and more. How did you begin your career in journalism? I guess it all started whilst studying. I read history and politics at Lancaster University and whilst there I wrote for SCAN, the student paper. It was great. I was heavily involved in student politics as I became President of my College, and after that I was President of the University Students Union. I enjoyed writing and standing up for people. So after that I became a researcher working on a number of political and social documentaries. I learnt a lot and got to travel across Europe and the US too, but I always wanted to be a reporter. 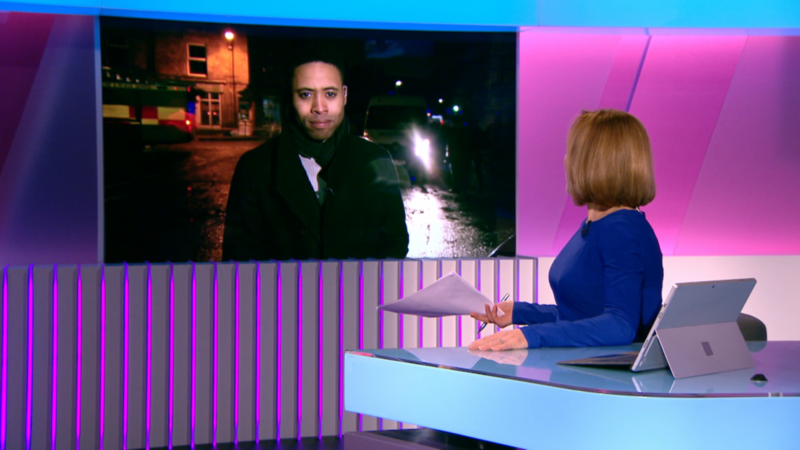 I was fortunate to gain a place to study for my postgraduate diploma in journalism at City University in London and then I became a Channel 4 News trainee. What were the biggest obstacles to developing your career? It’s a very competitive environment and I guess looking back maybe I was a bit cocky! In time I came to know the importance of taking good advice, speaking to the right people and working hard. I’m still learning though…all the time. I was fortunate enough to be brought up in a Christian home. For most of my life my parents went to two different church denominations – so two different services on a Sunday! With hindsight It was useful to see that it’s possible to have unity in belief but with diversity of expression. My parents never forced me to go to church or baptised me as a child, and so in my 20s I made a personal commitment myself after investigating who Jesus was and finding out if what he said was true. Baptism followed after that. I now attend an Anglican church in South London. Do you find it a challenge to juggle your faith alongside the demands of a busy newsroom? I can’t say that I find it difficult, but I’m sure like for many people the responsibility of knowing what your values mean influences how you interact with others. If it didn’t what would the point of being a Christian? We could just carry on as before… 1 Corinthians 15: 32 is useful here, - “...If the dead are not raised let us eat and drink and for tomorrow we die...” -although I’d love to find out if Paul did literally fight with wild beasts in Ephesus as he mentions in the line before. I do my best not to work on Sundays too. How did you come to hear about Christians in Media? An old University friend mentioned Christians in Media to me and it lead to me coming along to the annual conference. What is the most exhilarating/exciting story/feature you have covered? I’ve worked on a few general election campaigns now. The way things are going they’ll probably be another one soon... As a reporter I get to travel around the country and get a sense as to what’s happening and what people think. That all seems heightened with general election campaigns and I love the buzz of the shifting political sands and also the moments which can swing campaigns. I do like being up on election night and being there when historic events are unfolding. Is your work very stressful? If so, what are your coping mechanisms? I try to relax by exercising at the gym, reading, going to the cinema and playing football too. The holy answer of course is to say prayer. I do pray, but of course I, and I'm sure like many reading this, should pray a lot more. What is your preferred form of social media and why? Professionally I use Twitter a lot to keep track of developing news stories and also to see the latest comments by decision makers, leaders and other journalists. Being able to see stories develop so quickly is a really valuable tool, especially if you’re out on the road reporting. Do you know what you’d like to do in the long term? As well as news reporting and presenting I also run my own production company – Right Thing Films. We’re currently developing documentary and film ideas that tell important and transformative stories we think people should know about. It would be good to do work on some big projects whilst developing new young talent too. Do you think news outlets give Christianity a fair hearing? It depends what you mean. As a broadcaster who maintains impartiality I have a responsibility to do that whilst reporting and I think British Television news does this on the whole fairly well. Perhaps now though because Christianity in Britain is losing it’s place as the default moral compass, in favour of a more secular world view, there’s a sense that Christianity in the UK is having to find its footing, or even, having to develop the tools required to compete whilst maintaining authentic values in a more pluralistic society. I saw a Tim Keller lecture at Parliament last year where he argued that Christianity should always try and be salt to the world. Because there are now so many more media outlets through social media which Christianity can speak through arguably there’s never been a better time for anyone to get a ‘fairer hearing’. Maybe Christianity should be more confident. What is your advice to young people wanting to follow you into a career in journalism? Work hard, don’t ever think that you’re solely responsible for any success that comes your way, and pray for good fortune and guidance! If you fail along the way, you’ll learn from it. I have.